Memorial Day 2013 was an epic day in Columbus, GA, marking the grand opening of the longest urban whitewater venue in the world. That’s an urban whitewater rafting course on the Chattahoochee River, about an hour and a half from Atlanta. Columbus Fire and EMS has always provided water rescue and a dive team, but this challenge required specialized training and equipment beyond then-current capabilities. Members of the department attended swiftwater rescue classes and acquired additional equipment through normal budgetary methods. Almost all personnel staffing Station 1, the closet station to the river, have completed this training. Last year five people drowned in the river; often victims are fishermen or other visitors to the river banks. At the Ready met with Captain Brent Morris, the Columbus Fire and Emergency Medical Services Rescue Coordinator, and Lieutenant Brice Patterson from Station 1, in downtown Columbus, GA, to discuss this new attraction and how they prepared for its opening weekend. The Chattahoochee River had some challenging conditions to begin with. Two low-head dams were removed, which alleviated some dangers associated with them but in turn created new hazards for rescuers. The Army Corps of Engineers monitors and manages the river, which starts far north of Columbus at Carter Lake in Ellijay, GA. Hydroelectric power requirements require certain changes in flow throughout the day, when “gates” will open and close. These generation schedules change daily, and at varying times during the day. The water levels can change within 15 minutes based on your location on the river. On the 2.5-mile whitewater course, the water flows 2500-4000 cfs (cubic feet per second), but during high water levels, such as after a heavy rain, the course can easily reach 6000-8000 cfs, creating class IV rapids. The course from start to finish has a 40-foot elevation drop. While this is great for thrill-seekers, it poses challenges and dangers for rescuers. Safety of the rescue team is always the first consideration. A call to the dam operator can have the water “shut off,” but it will take 15 to 45 minutes based on rescuers’ location on the river for the water to “normalize” enough to safely put in a diver. Rescue teams are on scene in minutes, and can reach victims clinging to a rock with a highly trained and skilled team who have swum, dove, and practiced on every inch of the river. In fact, when the course was under construction, the rescue team SWAM the rapids (!) to “find the rocks” and other potential hazards for the rafters who were thrown from their boats. Changes to the course were made after recommendations by the team because “we had bruises and scrapes all over,” joked Lt. Patterson. The curriculum taught for the Columbus team is designed to address the unique needs of the region. 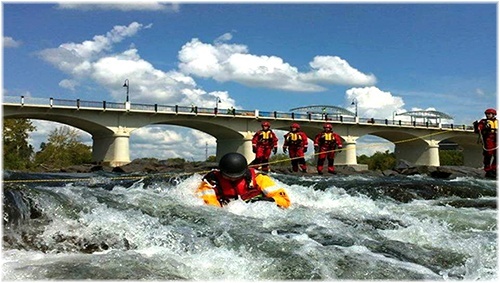 Based on NFPA Standards 1006 and 1670, and adapting the curriculum from several sources, including the Rescue 3 International courses, the training includes swiftwater rescue and night operations in the water. There are 17 divers on the team, and nearly one-third are paramedics. The Chattahoochee River is the natural border between Georgia and Alabama, with the state line being the bank of the river on the Alabama side. The State of Alabama Fire Departments also have trained rescuers to assist the Columbus team through mutual aid agreements across the state line. Depending on the location, dialing 911 may dispatch the Phenix, AL, City Fire Department. Because the water in the Chattahoochee stays relatively warm all year in Columbus, hypothermia doesn’t affect the “golden hour” to rescue and revive a victim. Last year, responding to a call for three victims in the river, the team had divers in the water within 16 minutes. After getting a “last point seen” location, these Chattahoochee experts have a pretty good idea where to go in and start searching safely. Whitewater Express, a local rafting outfitter, has its team of safety personnel who accompany the rafters on the course. 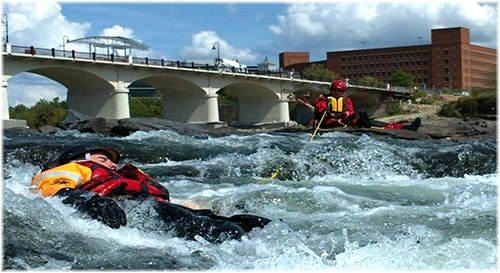 The Columbus Fire and EMS team often deals with incidents unrelated to the attraction because fishermen, kayakers, and others who are not Whitewater Express customers still use the Chattahoochee as they always have. The city of Columbus has passed an ordinance requiring lifejackets for anyone venturing near the water within the 2.5-mile course, and sirens on the river alert residents that the gates to the dam will open and the water will be rising. People may miss the sirens, however, so extra caution is required for anyone venturing down to the water. To contact Captain Morris, please send him an email at brentmorris@columbusga.org. He is happy to discuss how the Columbus Fire and EMS team and the Georgia Search and Rescue (GSAR) agencies train and prepare to protect Georgia.